Aster is a guardian of the ancient Kingdom of Bask appearing in Mario Tennis Aces. Not much is known about Aster's backstory, other than the fact that he was tasked by King Bask to guard the Temple of Bask as a spirit, and specifically keep Lucien's power in check. When Wario and Waluigi stole Lucien oblivious to its true powers, Aster asked Mario to recover the Power Stones before Lucien could, teaching him the Special Shot. Later on, when Lucien forced Mario to partake in the "Lucien Cup" to force the loser to hand over their Power Stones to the winner, Aster appeared to give Peach and Daisy the power of the Special Shot to face a corrupted Wario and Waluigi. At the end of the Lucien Cup, Aster then begged Mario to stop Bowser in his new transformation, Bowcien. After Bowcien is defeated, Aster thanks Mario before vanishing. 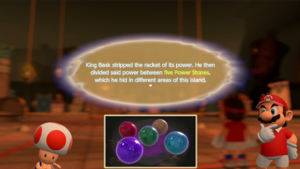 From version 2.0.0, after the player completes Ruins of Trials, Aster tells Mario that he is "a true king of tennis" and asks him to use that power to preserve peace around the world. The Japanese name for Lucien transliterates to Aster's English and Spanish name. This page was last edited on January 19, 2019, at 20:00.